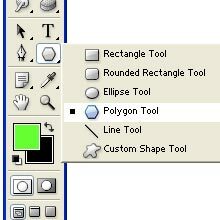 Polygon Tool is just below the Type tool and beside the path selection tool.This tool is a shape tool.With the help of Polygon Tool, we can draw Polygon shape of any size.We can also draw shape of a star with the help of this tool.We can increase the number of sides of the shape which we draw by mentioning the number on the top in the options bar.. This is the Polygon Tool.Go on to that tool and just click on it to select it. 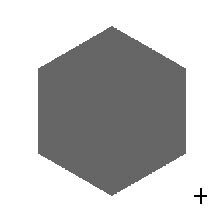 Select the Polygon Tool and position the pointer inside the work area and just click and drag.Now we can draw shape of a Polygon of any size. 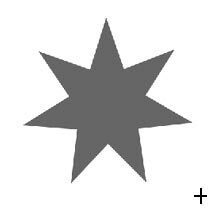 We can also draw shape of a star with the help of this tool.If we want to draw shape with different number of sides, then just mention the number of sides in the options bar and now drag the tool.